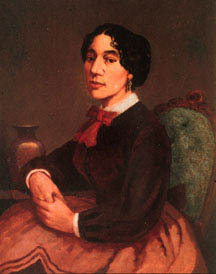 Christiana Bannister was born of mixed African-American and Native-American heritage to Mary and Charles Babcock, in North Kingstown, RI, around 1820, one of eight siblings. She may have spent part of her youth in Salem Massachusetts with her brother Charles, whose wife Cecilia Remond ran a Ladies Hair Work Salon. Christiana moved to Boston sometime before 1846 and worked as a milliner, and married Desiline Carteaux, listed variously as a cigar maker, clothes dealer and hairdresser. After a brief sojourn in Providence in 1850, Christiana returned to Boston and by 1853 had opened her own hair salon. In 1857 she married her second husband, the artist Edward Bannister who had begun to work in her salon in 1853. Christiana continued to work as a “Hair Doctress” at various locations in Boston over the next two decades, specializing in hair dying and hair restoration. Her career allowed Edward to pursue his own work as an artist. Like most such shops at the time, much of her clientele was male, though around 1857 she began to direct her advertisements more specifically towards women.The Remond family had earlier introduced Christiana to William Lloyd Garrison and other abolitionists, and she advertised her business in William Lloyd Garrison’s Liberator. Hair salons were also information centers on the Underground Railroad, and for two years the Bannisters lived with Lewis Hayden in Boston, whose home was a known stop on the railroad. Just after the Civil War Christiana also served as president of the Boston Colored Ladies’ Sanitary Committee, helping raise funds for disabled veterans and their families, and in her capacity as president, she personally presented one of four regimental flags to the men of the Fifty-Fourth Massachusetts Regiment. The Bannisters moved to Providence in 1869. While Edward furthered his artistic career, Christiana established her hairdressing business with new clientele, opening a salon on Burrill Street (off Westminster) under the name of Madame Carteaux. The couple prospered. They purchased a house on Swan Street and lived there from 1871 to 1876, and later lived with friends on the East Side. They were even able to rent a summer cottage on the bay. Christiana opened a new salon on Westminster Street in 1883, and the following year the couple purchased a new house on Benevolent Street where they lived until 1889. Christiana continued to be involved in aiding the poor and dispossessed in the African-American community. She led fundraising efforts for a home for aged colored women in Providence, soliciting donations from white society women to provide assistance for retired black, female domestic servants. Her efforts resulted in the opening of the Home for Aged Colored Women in 1890, and she was a member of the corporation from the time of the home’s opening. Tragically, the couple lived in poverty for their last few years. They were forced to move to a small house on Wilson Street in 1900. Edward died in January, 1901. In Sept. 1902, Christiana herself entered the Home, suffering from dementia. Only eight days later, the home’s managers declared her “violently insane” and she was transferred to the state asylum in Cranston, where she died on Dec. 29th of that year.